In the year 1944, World War II was still raging in both Europe and the Pacific. The blockbuster movie of the year was Going My Way, starring Bing Crosby. This movie was nominated for ten Oscars, of which it won seven, including Best Picture, Best Actor, and Best Song, among others. The song, sung by Crosby and a boys choir, was “Swinging on a Star,” a catchy tune about growing up and striving to better oneself. It was written by Jimmy Van Heusen and Johnny Burke and has been recorded many times since then by a star-studded list of singers, including Shari Lewis (and her puppets), Burl Ives, Frank Sinatra, and others. The whimsical lyrics include stars, moonbeams, a mule, a pig, and a fish. You can watch the version performed in a scene from the movie at this YouTube link. In that same year, the woman many of us would later lovingly call Mammaw was a young woman of only 30, but had already been married 12 years and had had four of her five children, one of whom is my father. It is not hard at all to imagine her back then joyfully humming that tune while tending her garden to feed her growing family. I have no doubt that she harvested White Half Runner beans that year by the bushel, as she did for many, many years to come. Throughout my childhood and for many years afterward, I can remember going to visit Mammaw every so often. We lived in the Bluegrass region of Central Kentucky, and she lived in the mountains of Eastern Kentucky, so it took several hours to get to her house. The time it took to get there dropped considerably each time they opened a new stretch of the Mountain Parkway, but the degree to which we would step back in time never seemed to change at all. Although modernity has slowly crept into the region, in many ways Appalachia remains a place untouched by time. Among the timeless traditions still practiced in that region is that of planting by the moon. For those who don’t know, planting by the moon has nothing to do with planting by moonlight at night. It has everything to do with planting different kinds of crops during different phases of the lunar cycle, and not planting anything at all during some phases. According to this tradition, beans should be planted while the moon is waxing from a quarter moon to a full moon. Before then or after then are bad times to plant beans. Mammaw adhered to this tradition religiously. She always had terrific crops. Whenever we would arrive at her house, Mammaw would have a feast well underway, with the warm smells of home cooking wafting throughout her house and spilling out onto the stoop as she greeted us at the door. She would welcome us with open arms and, without fail, apologize for not having much to offer us in the way of food. We would always go home stuffed. The menu would vary a little with the seasons, but some things were constants: we would always have chicken, mashed potatoes, and green beans. Other vegetables would come and go, depending on the season, as would the variety of desserts that she would inevitably bring out after everyone had completely gorged themselves. We could always count on the fact that she would have grown the potatoes and green beans in her garden. The potatoes would keep for many months in a root cellar; the beans had to be eaten fresh or canned for later consumption. Mammaw would can enough beans each year to last her until the next season. 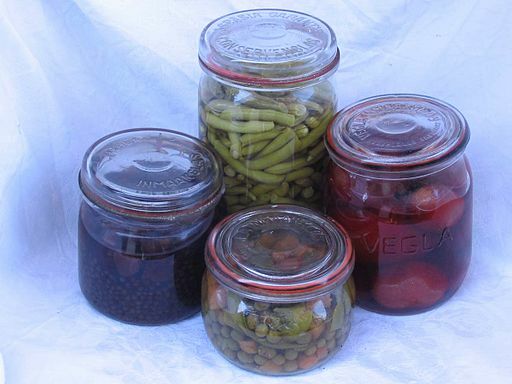 In good years, she would have plenty to give away, so on more than one occasion we would have jars of yummy-looking green beans accompanying us on the ride home. As the sun would slip behind the mountains, the moon and the stars would come out, and my sister and I would drift off in the back seat, probably humming some tune or other about the moon or stars or both, only to wake up as we pulled into the driveway at home. I still remember Mammaw’s green beans as the best I have ever tasted. Imagine my delight when I was looking for heirloom seed varieties and found an online source of what are in all likelihood the same beans that she used to grow! Allow me to digress for a moment in order to connect the dots. Mammaw was a woman of Appalachia, through and through. In most of my memories, she lived in the mountains of Eastern Kentucky, sometimes in Morgan County, sometimes in Magoffin County. I have been told that she also lived for a time in nearby Elliott County. Her family had been in Kentucky for generations, having first settled in the region before Kentucky was a state — in fact, before the United States had achieved independence. 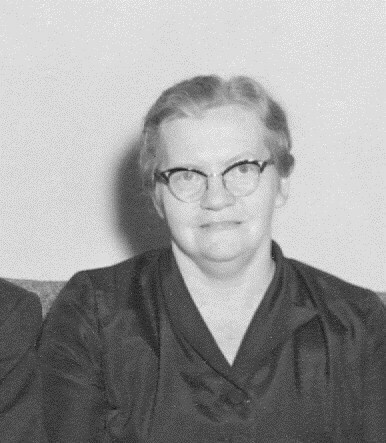 Along her paternal line, six generations of McGuires before her were either born or died (or both) in Kentucky. The first of these was her fourth great grandfather, James Felix McGuire, who was born in Ireland and was killed on August 19, 1782, in the last battle of the American Revolution, while serving under the command of Lt. Col. Daniel Boone at what is now Big Blue Lick State Park. Among the surnames found in Mammaw’s family history is a maternal line usually spelled Nickel, but sometimes spelled with two L’s, as Nickell. In my own genealogy research, I have found numerous Nickel/Nickell cousins, and am still adding to the list. So far, all the ones I have found are in Morgan County, although I have found relatives and ancestors with other surnames in Elliott County, which borders on Morgan. I frequently explore the Internet in pursuit of new ideas for my garden. Recently, I stumbled across the site for the Sustainable Mountain Agriculture Center, Inc (SMAC). Among the goals of this non-profit organization located in Berea, Kentucky, is the identification and preservation of heirloom varieties from Appalachia. 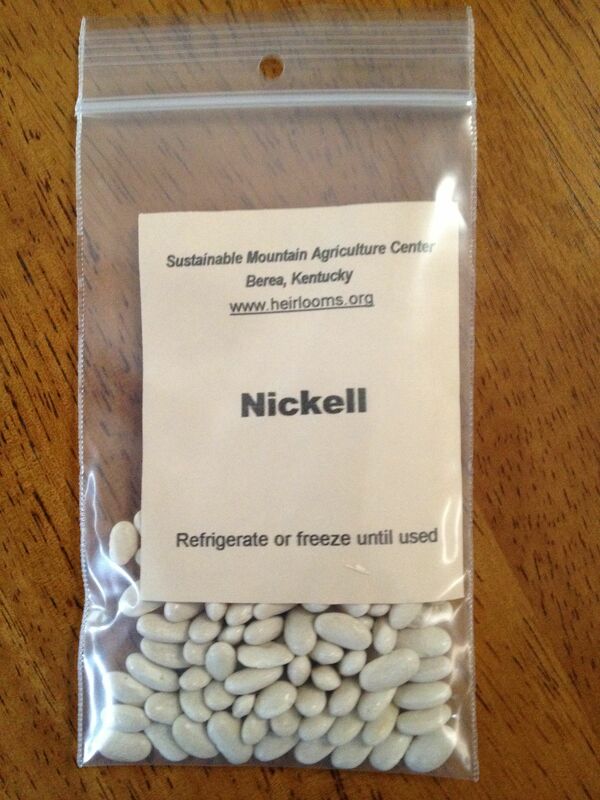 I just about dropped my iPad when I found that two of the varieties of White Half Runner beans they have are the Nickel Bean, from the Nickel family of Morgan County, and the Nickell Bean, from the Nickell family of Elliott County!! At first, I assumed that it was a single variety and that one of the ones listed was a typo. However, after exchanging some emails with the organization’s President, Dr. Bill Best, I came to understand that they actually have two different varieties, although they do not always have both available at the same time. I can’t help but suspect that the two are very closely related, and that the beans Mammaw grew were from one variety or the other. Mountain people most definitely share with one another and help each other out, so sharing bean seeds with neighbors and relatives would be a very natural thing to do. For this year, SMAC has the two-L Nickell bean, from Elliott County. I ordered mine and they arrived this week! It’s tempting to rush out and plant them right now. However, since I live in Central Florida now, instead of Central Kentucky, now is not a good time. Needless to say, these will have a special place in my fall garden as soon as the time is right. Speaking of timing, in memory of Mammaw, I should check the moon phases for the best time to plant these beans, just as she did for season after season and would have done today if she were still alive. If I do this right, I will harvest enough to can some. Only then will I be able to give some to my grandchildren so that they can carry their own moonbeans home in a jar. The picture at the topic of this post is from Wikimedia Commons. Source: Teunie at nl.wikipedia [GFDL (http://www.gnu.org/copyleft/fdl.html) or CC-BY-SA-3.0 (http://creativecommons.org/licenses/by-sa/3.0/)%5D.